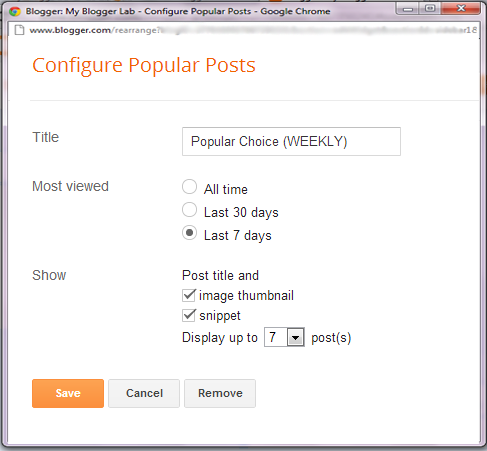 Do you want to alter your Blogger’s Popular Posts Widget to make it more prominent and attractive for your visitors? Having a Popular Posts Widget in the sidebar has numberless advantages. It helps new visitors to pick those articles that are most trending on a website. However, Blogger’s Built-in Popular posts widget is not that much attention-grabbing in terms of designing and displaying. Therefore, if you wish to transform your Popular Posts widget into a masterpiece then, you have to rely on CSS Style sheets. After lots of request from our loyal readers, finally we have decided to share our custom popular post design that we are using on this MBL Blog. In today’s article, we will reveal its CSS Style sheet. The Steps are extremely straightforward so you can easily customize your widget without facing any problem what so every. Just follow the following instructions. Go To Blogger >> Your Blog >> Layout. Add a Gadget >> Now within the list of widget look for “Popular Posts” and select it. Now match the settings which are shown in the screenshot below. Select “Last 7 Days” (Weekly). Make sure you check the “Image Thumbnail” and “Snippet” because we need to display Small images along the trendy article, this will add more spice to your site. You can display up to 10 trendy articles, but we would recommend you to select 7 from the Drop down list. Now go ahead and Save the widget and that’s it we have successfully integrated a Popular Post widget. Once again go to Blogger >> Template >> (Create a backup in case anything went wrong). Now with in the Template Search for ]]></b:skin> (CTRL+F Shortcut to quick search) and just above it paste the following CSS Coding. All Done: Finally, Press the Save Template button and you have successfully customized your y post widget. Now visit your site and enjoy the picture perfect results. We are pretty sure, that after customizing this widget, you will surly see a fascinating change in your traffic because your new readers will fancy their chances by viewing one of your trendy articles. Moreover, it will also play foremost role in reducing your bounce rate. We are receiving bulks of request from our readers who are asking us to share our custom MBL Theme. However, we have no plans at the moment to share it because it has become the trademark of this blog. We are planning to have a giveaway our First Anniversary you never know we might roll out our Template. Take a lot care of your love ones till then peace, blessings, and happy styling. applied successfully! But how to edit the Post title in this widget? Nyc but I think you can do more with this widget :) ¦ one question can you make a post on that widget which show author, label and comments just asking ? Yep, surly you can customize it according to you needs. We will surly share that author label and Commenting widget. Just Wait and Stay tuned. Salaam how can I just only show only titles not content? This was an awesome tutorial and worked nicely. I only have one question, how do I change the color of the double arrow (blue) to white? Thanks For Liking Our Efforts! Appreciate that. But that Blue Arrow is created through Image i.e. Ah. Ok. Could I remove it entirely? Also, could you take a look at my blog, the circles are not completely fill and I'm not sure where to edit. www.onfourthstreet.com. You guys are awesome. Thanks for your help. Yes, You can Remove it With Ease... Within Your Template Search and Remove the Following Image URL. Well The Circles are not completely filled because it re-size the image. It is essential that the width of the real image must be more then 400px . Syed, thank you again for your reply. This is the best blogger tutorial I've experienced. I checked my real image width and they are 600px. Is there anyway in your coding that I could decrease the size of the circle? Thanks Those Words are Gold for us. Well Actually we have used CSS3 to create Those Circle Thumbnails. Our Best Developers are Working on it and in coming up days we will release an improve version of it. Just Stay Tuned. If you want to Get Quality Blogger Tutorial Straight into your inbox then you can subscribe to our Feed. Have a Nice Day. Blessings! Bro!! Thank for your tutorial.You made my day.How can i make post title bold? Thanks For Liking the Tutorial. Well, Different Blogs have Different Post Style. Please Provide your Blog URL so we can provide few quick tips. Peace. Do you know any easy method of hiding a specific post from the popular posts widget?